It is the harsh truth for every bike rider – roof rack stands and roof racks for bikes cost a fortune. Without a doubt, this is an important decision to make, since spending a fortune on a low-quality rack can easily turn into a disaster. Having a high-quality trunk bike rack is extremely important. A rack will allow you to carry the bike around without any troubles, and the really great ones are easy to mount to your vehicle. The most promising and at the same time affordable manufacturers of quality bike racks are: Thule, Saris, Allen Sports, Yakima, SportsRack, ProRack, etc. But, if you were wondering which bike racks are trending in 2018, here is a list of the top 7 racks you should definitely consider. What Is The First Thing to Look For When Choosing a Bike Rack? What Can Go Wrong If You Choose the Wrong Bike Rack? What Security Issues Am I Facing? Should I choose a roof rack or a rear rack? The first choice for a mount bike rack this year is the Allen Sports Deluxe Bike Rack. This rack is highly affordable and made to fit most SUV’s, sedans, and minivans. 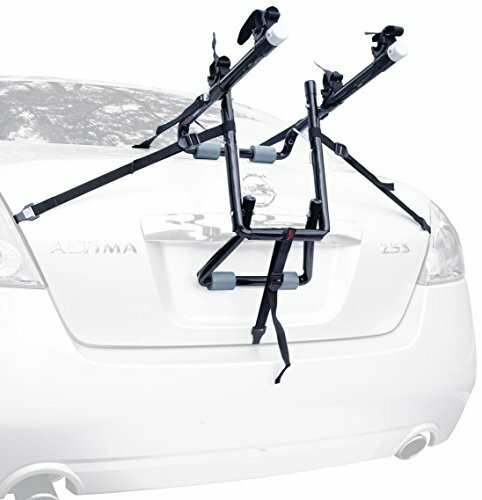 Allen Sports Deluxe Trunk Mount Bike Rack fits one or two bikes and is fully made of aluminum. This makes it very easy to tuck away, and very lightweight, which of course eases the installation process. In fact, the entire installation should take 10 minutes of your time, since the product already comes fully assembled. Straps are included in the package, making it possible for you to give your bikes complete stability. All sides are cushioned to prevent any damage to the vehicle. The Hollywood Racks F4 Heavy-Duty 4-Bike Rack is one of the top choices of bike lovers, and for many reasons. It is meant to carry a bigger load of bikes, and is the perfect choice for a family set. If you were looking to find a rack that fits all your family’s bikes, this is it! The Hollywood Racks F4 Heavy-Duty 4-Bike Rack has an extra heavy-duty tubing made of steel, dual-positioning system, and various straps. Starting from the integrated strap to tie down, to the extra straps for the sides, the package allows you to keep all bikes and the vehicle completely safe during the drive. This rack can fit on SUVs, minivans, and sedans, and comes pre-assembled for your convenience. It is without a doubt the strongest bicycle rack on the current market, specifically created for heavy-duty load. The Saris 805 2-Bike rack is made of 100% recyclable material. The injection-molded plastic used in the production is not like that cheap plastic that may crack in extreme temperatures. Even though it is recyclable, it has high duration and is non-rustable. 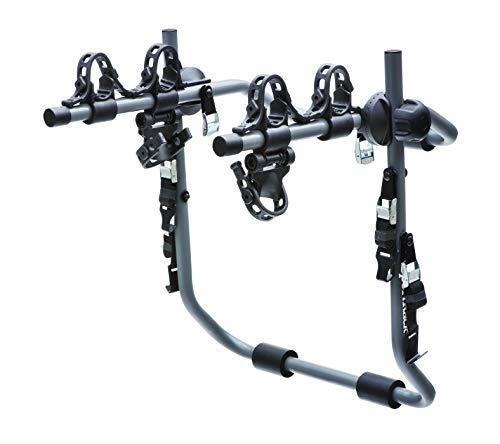 The soft straps that are created to hold the two bikes you can place on this rack are made of rubber, and are extremely powerful in keeping them intact. When you are driving around in your vehicles with your bike or bikes placed on the Saris 805 Bike Rack Trunk, you don’t have to worry that they will bounce and damage the car. The carrier is adjustable to the vehicle and very easy to place. Its materials are recyclable, but among the most durative you can find in bike racks. The Yakima SuperJoe Pro 3-Bike Rack is designed to carry up to 3 bikes without doing damage to your vehicle. It is optimized to provide more stability on a truck, and is made of a sturdy steel construction. 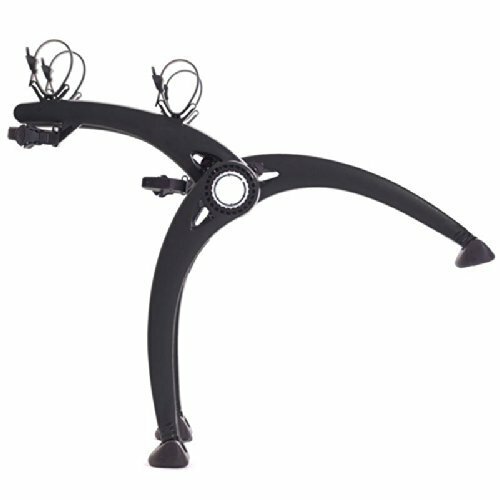 Featuring a Quick Trigger II hub system, this bike rack is very easy to install. The product contains oversized feet that are padded, as well as buckles coated with metal – all with the goal to keep the vehicle protected from damage. The Planet Payback Initiative strives to consume a limited amount of energy and create less waste. This is the goal of Yakima – to use recycled content to save the environment. All plastic and steel parts on the products are recyclable, including this rack. The StableCradles integrated into the rack keep the bike protected and firmly in place. 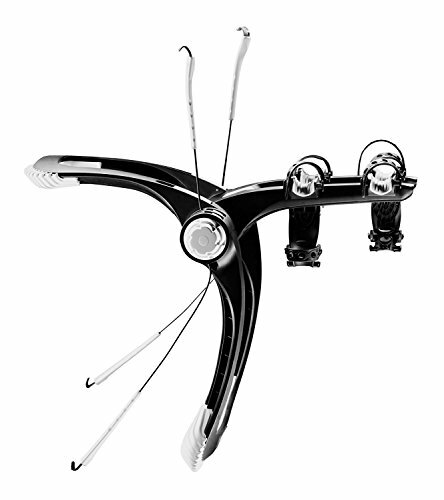 Its narrow arm design can fit a solid variety of bike frames, and you will find integrated bottle openers. The Thule 9001 Raceway 2-bike carrier is more than a tool you can use to carry two bikes at once. This rack supplies a very strong and stable storage, and you don’t need to install a hitch receiver to enjoy this advantage. This product has the Thule’s patented technology FitDial. This means that the rack is very easy and fast to install, and fits a very wide range of vehicles. All you have to do to fit the carrier to the trunk is to lift the release lever, open the frame position, and lock the bike into the desired place. The pads are molded and made of rubber, which provides a stronghold and protects both items from scratching. The bike arms can be folded vertically, against the carrier’s body for more convenient placing and storage. The product comes with a lockable cable you can use to secure the bike, as well as carrier locks to the vehicles and cable connections. Read this review of the product for more detailed information. Do you want to transport several bikes safely, without scratching your vehicle? 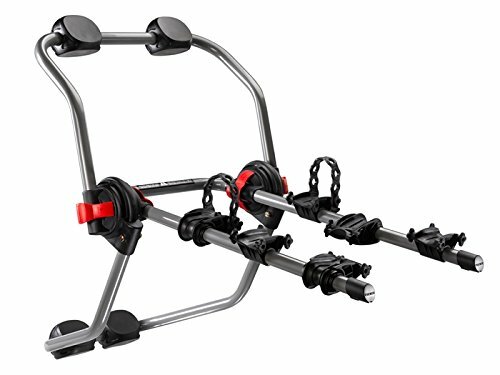 The SportRack 3-Bike Anti-Sway bike rack is compatible with bikes of all sizes and frames, and is very easy to mount. As the name suggests, this rack allows you to carry 1, 2, or 3 bicycles, and keep both your bikes and the vehicles unharmed. The rack uses a hub system that secures the bikes, and is foldable for storage. The soft anti-sway cradles are combined with dual support arms and are made of rubber, making it possible for you to mount and carry the bikes without damaging the paint of the vehicle or the bikes themselves. This carrier has six straps that are adjustable and used to attach the rack to the trunk. Are you often travelling and need a hitch to transport your bike from one place to another on the back of your RV? 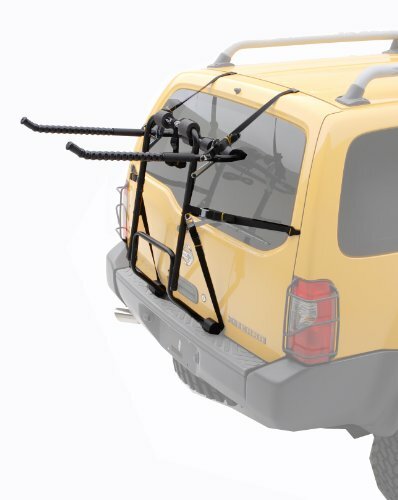 This bumper rack allows you to transport up to two bikes on a camper trailer or an RV. 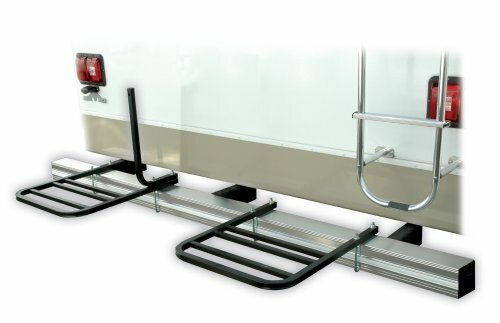 The Swagman bumper rack is made of high-quality materials – a steel construction that is powder-coated to resist corrosion, and a black paint finish that looks great on any RV. It can transport up to 2 bicycles that are maximum 30lb. each. U-Bolts are provided, allowing you to secure the steel. A bike rack is a very helpful tool for transporting bicycle/bicycles with your vehicle. All you have to do is install a rack, and secure the bikes on it. With a bike rack, you can carry your bikes wherever you need to. The first thing to look for when choosing a bike rack is whether it fits on your car. If it is not compatible with your vehicle, the price and quality won’t really matter. Most racks producers share a list of cars that are compatible with the product. You may also be able to get your hands on a catalog of all accessory products, and see how to attach the rack to your vehicle. However, before you invest your money in a rack, you should make sure that that rack will fit your vehicle. If you cannot find this information in the description, contact the dealer and ask them. Most bike racks come with security issues. For some racks, you can purchase separate locks that consist of a cable that has rubber disks on its ends. However, most cyclists believe that locks won’t prevent a thief from taking your bike rack, but can slow them down. Security is an issue with every bike rack, so we recommend that you never leave your bikes unattended on the rack for an extended period of time. The cables can be cut, and many don’t even have such security options. There are two main types of bike racks: roof and read. The rear-mount racks are more affordable, easier to install, fitting to a broader variety of vehicles, and therefore, much more popular. There isn’t such a thing as a perfect rack. A rack can have all the features you need, but not be compatible with your vehicle. Another rack may be great, but too expensive for you. But, if you are asking yourself which type of rack to choose, you should consider all factors. Roof-mount tracks are recommended to those who want to carry a larger equipment. If you do not need to carry a larger equipment and want to transport your bicycles on regular basis, you may want to think twice about choosing a roof rack. If you have a tall vehicle, you will find it exhausting to lift the bikes over the head, and the mounting can be very tricky. In addition, roof racks only allow you to carry one or two bikes, while rear-racks can be used to carry more. This will, of course, depend on the type of rack you are purchasing. Some can be installed in minutes because they come fully assembled, others come partially assembled, and there are some that you need to assemble on your own. Depending on the bike rack you choose, the installation process can take minutes or hours. Of course, there is also the matter of style. As soon as you find a good quality bike rack, you can focus on which looks good when mounted on the vehicle. With so many companies producing bike racks, the competition has become huge. As a result, most of the quality companies have produced and mastered a variety of designs. When you have a good rack to transport your bike, there is no limit as to where you can take it. This selection of bike racks is not only an affordable, but a very helpful way to transfer your gear safely and start a new biking adventure.